Microglia are the primary immune cells of the CNS, and are highly similar to peripheral macrophages. 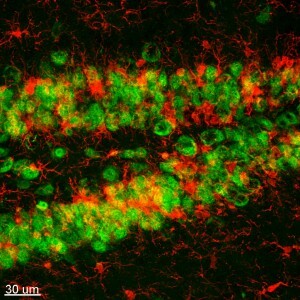 They act as the major inflammatory cell type in the brain, and respond to pathogens and injury by becoming “activated” – a process whereby they rapidly change morphology, proliferate and migrate to the site of infection/injury where they phagocytose and destroy pathogens as well as remove damaged cells. As part of their response they secrete cytokines and chemokines, as well as prostaglandins, NO and reactive oxygen species, which help to elevate and direct the immune response. Additionally, they are instrumental in the resolution of the inflammatory response, through the production of anti-inflammatory cytokines such as Il-10. While seeking out and destroying pathogens is an important and protective role, microglia have also been extensively studied for their harmful roles in neurodegenerative diseases and brain injuries, such as Alzheimer’s disease, Parkinson’s disease, ischemic injury, and traumatic brain injuries. We have discovered that microglia in the adult brain are fully dependent upon Colony-Stimulating Factor 1 receptor (CSF1R) signaling for their survival, and that we can take advantage of this dependency through the administration of specific CSF1R inhibitors that cross the blood brain barrier. Administration of CSF1R inhibitors results in the rapid elimination of microglia from the adult brain – within 7 days of continuous treatment ~80% of all microglia are eliminated, and by 21 days of continual treatment >95% of all microglia are eliminated. 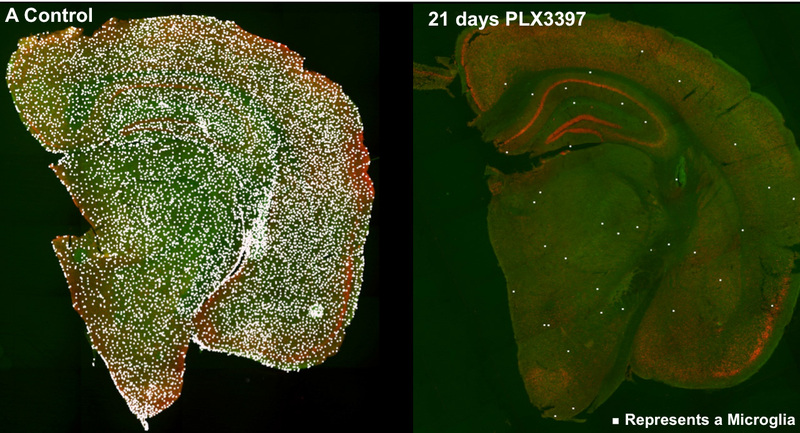 The above image shows sections through 2-month old wild-type mice that have been treated with the CSF1R inhibitor PLX3397 for 21 days. Each microglia has been marked with a white dot, showing the remarkable and sustained elimination of microglia from the entire CNS with CSF1R inhibitors. Microglia remain eliminated for as long as we continue CSF1R inhibitor treatment. Thus, our finding allows for rapid and sustained elimination of microglia from the adult brain regardless of age or genotype and permits studies into microglial function that have not been previously possible. Mice depleted of microglia are healthy, fully viable, and have no measurable or obvious defects. Furthermore, no impairments in behavior, cognition or motor function result from long-term microglial-elimination, showing that microglia are not overtly necessary for these functions in the adult brain. We are continuing to study the consequences of microglial-elimination and in doing so uncover some of the functions of microglia in the healthy brain. Microglia are negatively implicated in Alzheimer’s disease. Parkinson’s disease, Huntington’s disease, Frontal Temporal dementias, ALS, Traumatic Brain Injuries, Ischaemic Strokes, Epilepsy, and many more. Thus, this approach can be applied to a number of conditions as a potential therapeutic, but can also be used to understand the role of microglia in these diseased states, as well as in the healthy adult brain.